Looking to restock your bath linen this spring? 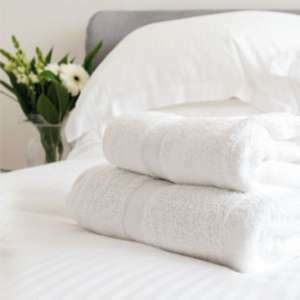 The Supreme Premier bath linen range is the king of cotton towels. White, fluffy and featuring an attractive popcorn header bar, the 600gsm Supreme Premier range offers guests the 5* experience. Made from 100% cotton and manufactured in our partner mills, these towels look great, feel fabulous, and last longer thanks to strengthened hems and the finest raw materials.